Utility supporting the EyeSpy 247 F+ and similar cameras (beta). Is there a better alternative to IP Camera Utility? Is IP Camera Utility really the best app in Security category? Will IP Camera Utility work good on macOS 10.13.4? IP Camera Utility is a utility supporting the EyeSpy 247 F+ and similar cameras. Fixes bug making images and sound out of sync in saved movie after administrator username and password entered (credentials are required for frame rate to be detected, but previously restart was required before movies were saved correctly). IP Camera Utility needs a review. Be the first to review this app and get the discussion started! IP Camera Utility needs a rating. Be the first to rate this app and get the discussion started! 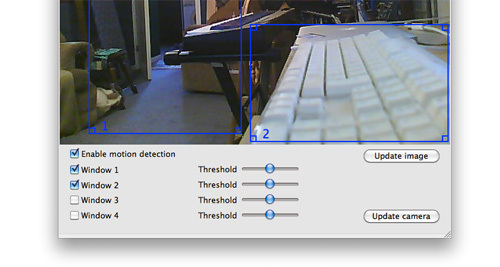 Certain cameras like the Eyespy 247 F+ have admin features (in particular, setting up motion detection areas) which make use of ActiveX and therefore aren't accessible from OSX. This free application fills in those gaps. It also adds a sound trigger which isn't built into these cameras. The list of cameras supported is small, including certain older cameras manufactured by Sercomm for EyeSpy 247, Xanboo and others. If the 'Find Cameras' feature finds your camera, this doesn't mean that your camera is actually supported.